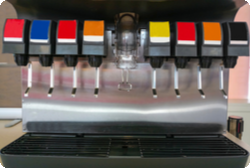 Tests conducted at self-service soda machines have shown an unacceptable level of harmful bacteria. The Beverage Fountain is a busy self-service area that requires employees to be vigilant in cleaning and sanitizing. This online course provides instruction for sanitizing fountain areas, cleaning nozzles and diffusers, and flushing and cleaning the tubes and ice machine. Employees learn that customer safety and the store’s reputation depends on their adherence to strict safety and sanitation procedures.